�Singing in its natural sense is an involuntary act that expresses delight, sorrow, joy or any other movement of soul,� as Georgy Sviridov explained his understanding of vocal art. Sviridov, as no-one else, felt the beauty of poetic style and knew all the nuances of the singing voice. Sviridov worked with singers a lot, including some of the most prominent names of the Soviet vocal school. 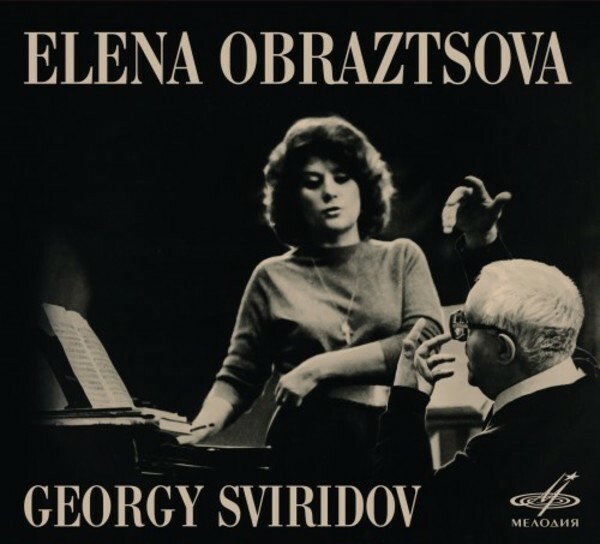 This album showcases the fruit of creative collaboration between Georgy Sviridov and Elena Obraztsova, one of the best Russian female singers of the 20th century. Although Obraztsova performed on the most famous operatic stages of the world, she devoted as much attention to chamber singing. She who sang with the greatest conductors of the century made up an ideal team with Sviridov. The composer was particularly fond of the poetry of Alexander Blok and Sergei Yesenin with their piercing sense of tragedy of being and personal complicity in the fate of Russia. Performed by Obraztsova, Sviridov�s music sounds like an �involuntary movement of the soul,� a harmonious realization of poetic verse. The programme features some of the Romances and Songs from the cycle St Petersburg Songs set to Blok�s poems, the poem Cast Off Russia to Yesenin�s poems, and an excerpt from the chorus cycle Songs from Hard Times based on Blok�s verses. The performers are the best choirs of Moscow (the Moscow Chamber Choir led by Vladimir Minin and the chamber line-up of the Yurlov Republican Academic Capella) and the renowned singer Makvala Kasrashvili. The piano is played by Georgy Sviridov. The tracks were recorded in the Melodiya studios and live at the Grand Hall of the Moscow Conservatory in 1980 and at the Grand Hall of the Leningrad Philharmonic Society in 1983.